Model of Chelomei's UR-100 ICBM. Russian intercontinental ballistic missile. The UR-100 lightweight ICBM was the Soviet answer to the US Minuteman and was deployed in larger numbers than any other in history. It remained an enigma outside of intelligence circles in the West until after the collapse of the Soviet Union. It allowed the Soviet Union to match, and then surpass the United States in strategic deterrent capability. As such it was Vladimir Chelomei's crowning legacy to his country. AKA: 15A10;15F842;15P784;8K84;RS-10;Sego;SS-11 Mod.1. Status: Retired 1984. First Launch: 1965-01-01. Last Launch: 1983-03-03. Number: 262 . Payload: 770 kg (1,690 lb). 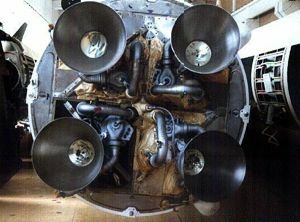 Thrust: 785.00 kN (176,475 lbf). Gross mass: 41,410 kg (91,290 lb). Height: 16.93 m (55.53 ft). Diameter: 2.00 m (6.50 ft). Span: 2.00 m (6.50 ft). Apogee: 1,000 km (600 mi). Official go-ahead for development of the 8K84 was on 30 March 1963 (Russian sources say the 8K84 missile put into production was not related to Chelomei's original actual UR-100 design. However this correlation came into general acceptance retroactively). The decree called for a silo-launched missile that could be stored in a fuelled condition for at least five years as a 'certified round', ready to be launched at short notice. Submarine-launched and anti-ballistic missile versions of the missile were also to be designed, but no pad-launched variant was envisioned. Chelomei had already been working on the missile for several years, with tests of the planned radio-guidance system starting in 1962. The 15P784 silo was designed by Spetsmash. Such was the urgency to overcome the massive US superiority in ICBM's, surveys were already underway to identify suitable sites for missile silos accessible by rail spurs. The teams consisted of geologic and geodesic specialists under the leadership of Yevgeniy Yevtigneyev. Their missions were so secret they used the cover and resources of Uralgaz and the leader could only identify himself as a 'general from Moscow'. The teams travelled by train, truck and horse to reach the potential silo locations. Construction of launch silos at the selected locations all over the Soviet Union began in 1964 even before the missile was tested. This was a huge industrial enterprise, the construction of the 1130 silos for the UR-100 and 308 for the R-36 occupying a peak workforce of 650,000 until 1973. Construction of these silos involved a total cost of one billion rubles and the removal of 120 million cubic meters of earth. There was an enormous amount of completely new technology to be mastered. This included not just the sealed missile (which had to resist corrosive propellants 20,000 times more aggressive than those used previously for many years), but the integrated transport/storage container and silo ejection technique. Production of the missile itself was conducted at three factories -- the Khrunichev facility in Moscow; Factory 166 (later PO Polyot) in Omsk; and Factory 47 (later PO Strela) in Orenburg. One prototype command point and ten missile silos were built at Baikonur for the flight tests. 60 trials flights were conducted from 19 April 1965 to 27 October 1966, with the first silo launch on 17 July 1965. The first regiments at Bershet and Drovyanaya became operational on 17 July 1966, before the test series was completed. 90 silos were operational by the end of 1966 and the missile and silo were accepted for military service on 21 July 1967. In field deployment a single hardened command point controlled ten silos. The silos could resist an over-pressure of 20 atmospheres, equivalent to explosion of a one megaton bomb 1300 meters from the silo. Deployment rose to 540 by 1968, 840 by 1970, and 940 in 1961. By 1974 the peak of 1030 UR-100 silos were in operation. By that time 106 UR-100's had been launched in trials flights and another 54 flown from military bases. The last UR-100 was withdrawn from service in 1988. However UR-100's were replaced in their silos by UR-100M's, UR-100K's, UR-100N's, UR-100NU's, and even MR-UR-100's by another manufacturer, proving the worth of the containerized missile concept. The UR-100 was the first Soviet ICBM with a three minute reaction time - from key turn to lift-off - a huge accomplishment for a liquid propellant vehicle. To make this reaction time possible the vehicle stayed fuelled throughout its guaranteed storage lifetime of five years (extended to first 8, then 10, then 17 years based on in-service tests). This was achieved by encapsulation of the missile in a container in which this missile stayed from production until launch. The container was designed by OKB-52 Filial 2, weighed 14.4 metric tons, had a diameter of 2.7 meters, and a length of 19.5 meters. The missile was mounted on rails within the container and internal plumbing necessary for start-up of the missile was sealed within the container. ICBM with range up to 11,000 km with a light (770 kg) warhead, re-entry vehicle designed by Kocaryats at VNIITF and warhead by Arazamas-16. MRBM (up to 4000 km) with a heavy (1750 kg) warhead, designed at VNIITF with warhead by Chelyabinsk-70. The guidance system by Kuznetsov and inertial navigation system by Pilyugin were designed to work with any of these configurations and the vehicle could be converted from one to another within 24 hours. Missiles could be programmed for launch plus or minus 30 degrees from their standard corridor. The Palma countermeasures suite by Gerasimenko at NII-108 was fitted to spoof enemy anti-ballistic missile defenses. Propellant tanks were constructed of AMG-6 aluminum alloy. The rocket was normally painted white, and the light warhead version had a strict conic shape. The heavy warhead was longer, but with the same base diameter. The first five launches of the missile from Baikonur used radio-inertial guidance with a radio-command correction system by Ryazinskiy. Later testing gave the military confidence that the pure inertial guidance was precise enough, and the radio receiver was removed in production models. Work on the Taran ABM version began in 1962-1963. The concept was ingenious, in that offensive missiles could be turned into defensive missiles in response to changes in enemy posture. For use as an ABM the launch complex need some additional equipment and the missile carried a 10 megaton warhead. Incoming missile tracking for Taran would be provided by the TsSO-S radar system located 500 km from Moscow. Taran would be used with the shorter-range A-350 missile developed for the defense of Moscow as part of a layered defense. However Taran could defend, from a single basing area, the most heavily populated area of the Soviet Union, from Leningrad to Moscow. However after the fall of Khrushchev, Chelomei's patron, further work on the Taran system was abandoned. In total, 12 Strategic Rocket Forces divisions were equipped with the various models of the basic UR-100 (UR-100, UR-100M, UR-100K, UR-100U). Production of these versions extended from 1964 to 1974. There were a total of 162 test and operational test launches of these models. Of these, 67 were tests of the UR-100U. UR-100 artifacts may be found at Orevo, which has a complete sectioned missile, and Baikonur, which has models and photographs. Maximum range: 11,000 km (6,000 mi). Number Standard Warheads: 1. Standard RV: 15F842. Warhead yield: 500 KT. CEP: 1.40 km (0.80 mi). Alternate warhead: 1,750 kg (3,850 lb). Maximum range with alternate warhead: 4,000 km (2,400 mi). Number Alternate Warheads: 1. Alternate warhead yield: 1,100 KT. Alternate warhead CEP: 1.00 km (0.60 mi). Boost Propulsion: Storable liquid rocket, N2O4/UDMH. Cruise engine: 8D423. Initial Operational Capability: 1966. Total Number Built: 790. Stage 1. 1 x UR-100 Stage 1. Gross Mass: 32,799 kg (72,309 lb). Empty Mass: 3,000 kg (6,600 lb). Thrust (vac): 868.800 kN (195,314 lbf). Isp: 310 sec. Burn time: 102 sec. Isp(sl): 280 sec. Diameter: 1.60 m (5.20 ft). Span: 1.60 m (5.20 ft). Length: 10.00 m (32.00 ft). Propellants: N2O4/UDMH. No Engines: 4. Engine: RD-0216. Other designations: 8K84 Stage 1. Status: Out of Production. Comments: Orevo has sectioned hardware. Total mass, sea level thrust accurate; Isp, empty mass and burn time estimated. Source: Placard, Orevo. Stage 2. 1 x UR-100 Stage 2. Gross Mass: 8,611 kg (18,984 lb). Empty Mass: 900 kg (1,980 lb). Thrust (vac): 131.448 kN (29,551 lbf). Isp: 325 sec. Burn time: 184 sec. Diameter: 2.00 m (6.50 ft). Span: 1.30 m (4.20 ft). Length: 6.69 m (21.95 ft). Propellants: N2O4/UDMH. No Engines: 1. Engine: 8D423. Other designations: 8K84 Stage 2. Status: Out of Production. Comments: Orevo has sectioned hardware. Total mass, thrust accurate; Isp, empty mass and burn time estimated. Source: Placard, Orevo. R-26 Ukrainian intercontinental ballistic missile. Two stage light ICBM developed 1960-1962, but cancelled so that Yangel could concentrate his efforts on the R-36. After project cancellation, a mock-up of this missile was shown in Moscow parades and misidentified for years by Western analysts as the 'SS-8'. UR-100M SLBM Russian intercontinental ballistic missile. The UR-100M designation was used for a naval version of the UR-100, developed by Chelomei in 1962-1964. This would fit in the Navy's D-8 launch system. It was rejected in favour of the R-29 from Makeyev, who became the Navy's traditional supplier of SLBM's. UR-100K Russian intercontinental ballistic missile. The UR-100K was a version of the 8K84M with further improvements in accuracy and capable of delivering three separate (but not independently targeted) re-entry vehicles. UR-100 8K84M Russian intercontinental ballistic missile. UR-100M Russian intercontinental ballistic missile. The 8K84M was an improved version of the UR-100 with an improved empty mass fraction, a new guidance system, countermeasures capability, and post-boost maneuverability to defeat enemy anti-ballistic missile systems. UR-100U Russian intercontinental ballistic missile. The UR-100U was a development of the UR-100K with improved shock isolation in the silo. Family: ICBM, silo-launched. Country: Russia. Engines: RD-0215, 8D423, Izotov UR-100 stage 2 vernier, RD-0216. Launch Sites: Baikonur, Baikonur LC130, Baikonur LC131. Stages: 8S816, 8S817. Agency: Chelomei bureau. Bibliography: 193, 2, 220, 273, 475, 476, 8744. 1965 - . Launch Site: Baikonur. Launch Vehicle: UR-100. State trials missile test - . Nation: Russia. Agency: RVSN. Apogee: 1,000 km (600 mi). 1965 April 19 - . 02:20 GMT - . Launch Site: Baikonur. Launch Complex: Baikonur LC130. Launch Vehicle: UR-100. 1965 May 20 - . 03:45 GMT - . Launch Site: Baikonur. Launch Vehicle: UR-100. FAILURE: Failure. State trials missile test - . Nation: Russia. Agency: RVSN. Apogee: 0 km (0 mi). 1965 June 19 - . Launch Site: Baikonur. Launch Vehicle: UR-100. FAILURE: Failure. 1965 July 10 - . Launch Site: Baikonur. Launch Vehicle: UR-100. FAILURE: Failure. 1965 July 17 - . Launch Site: Baikonur. Launch Complex: Baikonur LC131. Launch Vehicle: UR-100. FAILURE: Failure. 1965 July 31 - . Launch Site: Baikonur. Launch Complex: Baikonur LC131. Launch Pad: LC131?. Launch Vehicle: UR-100. FAILURE: Failure. 1965 September 17 - . Launch Site: Baikonur. Launch Complex: Baikonur LC131. Launch Vehicle: UR-100. FAILURE: Failure. 1965 September 25 - . Launch Site: Baikonur. Launch Vehicle: UR-100. FAILURE: Failure. 1965 November 3 - . Launch Site: Baikonur. Launch Vehicle: UR-100. FAILURE: Failure. 1965 November 5 - . Launch Site: Baikonur. Launch Vehicle: UR-100. FAILURE: Failure. 1965 November 30 - . Launch Site: Baikonur. Launch Vehicle: UR-100. FAILURE: Failure. 1965 December 19 - . Launch Site: Baikonur. Launch Vehicle: UR-100. FAILURE: Failure. 1965 December 30 - . Launch Site: Baikonur. Launch Vehicle: UR-100. LKI - . Nation: Kazakhstan. Agency: RVSN. Apogee: 1,000 km (600 mi). 1965 December 30 - . Launch Site: Baikonur. Launch Vehicle: UR-100. FAILURE: Failure. 1966 - . Launch Site: Baikonur. Launch Vehicle: UR-100. Joint flight trials launch - . Nation: Russia. Agency: RVSN. Apogee: 1,000 km (600 mi). SLI missile test - . Nation: Russia. Agency: RVSN. Apogee: 1,000 km (600 mi). 1966 April 21 - . Launch Site: Baikonur. Launch Vehicle: UR-100. FAILURE: Failure. Joint flight trials launch - . Nation: Russia. Agency: RVSN. Apogee: 0 km (0 mi). 1966 June 11 - . Launch Site: Baikonur. Launch Vehicle: UR-100. FAILURE: Failure. 1966 August 15 - . Launch Site: Baikonur. Launch Vehicle: UR-100. FAILURE: Failure. 1966 October 27 - . Launch Site: Baikonur. Launch Vehicle: UR-100. SLI Last operational test launch - . Nation: Russia. Agency: RVSN. Apogee: 1,000 km (600 mi). 1967 - . Launch Site: Baikonur. Launch Vehicle: UR-100. Operational missile test - . Nation: Russia. Agency: RVSN. Apogee: 1,000 km (600 mi). 1967 January 25 - . Launch Site: Baikonur. Launch Vehicle: UR-100. FAILURE: Failure. Operational missile test - . Nation: Russia. Agency: RVSN. Apogee: 0 km (0 mi). 1967 Jun - . Launch Site: Drovyanaya. Launch Vehicle: UR-100. ICBM operational test launch from missile base silo - . Nation: Russia. Agency: RVSN. Apogee: 1,000 km (600 mi). 1967 July 20 - . Launch Site: Gladkaya. Launch Vehicle: UR-100. 1968 - . Launch Site: Baikonur. Launch Vehicle: UR-100. 1968? - . Launch Site: Teikovo. Launch Vehicle: UR-100. Nation: Russia. Agency: RVSN. Apogee: 1,000 km (600 mi). 1968? - . Launch Site: Gladkaya. Launch Vehicle: UR-100. ICBM operational test launch from missile base silo - . Nation: Russia. Agency: RVSN. Apogee: 1,000 km (600 mi). 1967-69. 1968 Mar - . Launch Site: Dombarovskiy. Launch Vehicle: UR-100. 1968 July 10 - . Launch Site: Bershet. Launch Vehicle: UR-100. 1969 - . Launch Site: Baikonur. LV Family: UR-100. Launch Vehicle: UR-100K. State trials launch - . Nation: Russia. Agency: RVSN. Apogee: 1,000 km (600 mi). 1969? - . Launch Site: Teikovo. Launch Vehicle: UR-100. 1969 - . Launch Site: Baikonur. Launch Vehicle: UR-100. Operational test - . Nation: Russia. Agency: RVSN. Apogee: 1,000 km (600 mi). 1969 July 23 - . Launch Site: Baikonur. LV Family: UR-100. Launch Vehicle: UR-100K. Phase 1 state trials flight - . Nation: Russia. Agency: RVSN. Apogee: 1,000 km (600 mi). 1969 July 24 - . Launch Site: Kostroma. Launch Vehicle: UR-100. 1969 July 27 - . Launch Site: Kostroma. Launch Vehicle: UR-100. 1970 - . Launch Site: Baikonur. LV Family: UR-100. Launch Vehicle: UR-100K. 1970 - . Launch Site: Baikonur. LV Family: UR-100. Launch Vehicle: UR-100M. 1970 - . Launch Site: Baikonur. Launch Vehicle: UR-100. 1970 June 21 - . Launch Site: Teikovo. Launch Vehicle: UR-100. 1970 July 27 - . Launch Site: Baikonur. LV Family: UR-100. Launch Vehicle: UR-100M. 1970 July 28 - . Launch Site: Baikonur. LV Family: UR-100. Launch Vehicle: UR-100M. 1970 August 1 - . Launch Site: Baikonur. LV Family: UR-100. Launch Vehicle: UR-100M. 1970 November 11 - . Launch Site: Teikovo. Launch Vehicle: UR-100. 1970 November 11 - . Launch Site: Bershet. Launch Vehicle: UR-100. 1970 November 11 - . Launch Site: Kostroma. Launch Vehicle: UR-100. 1970 November 12 - . Launch Site: Gladkaya. Launch Vehicle: UR-100. 1970 December 28 - . Launch Site: Baikonur. LV Family: UR-100. Launch Vehicle: UR-100K. FAILURE: Failure. 1971 - . Launch Site: Baikonur. LV Family: UR-100. Launch Vehicle: UR-100U. 1971 - . Launch Site: Baikonur. LV Family: UR-100. Launch Vehicle: UR-100M. 1971? - . Launch Site: Teikovo. Launch Vehicle: UR-100. 1971 - . Launch Site: Baikonur. Launch Vehicle: UR-100. 1971 - . Launch Site: Baikonur. LV Family: UR-100. Launch Vehicle: UR-100K. 1971 February 2 - . Launch Site: Baikonur. LV Family: UR-100. Launch Vehicle: UR-100M. First State trials launch - . Nation: Russia. Agency: RVSN. Apogee: 1,000 km (600 mi). 1971 February 12 - . Launch Site: Baikonur. LV Family: UR-100. Launch Vehicle: UR-100M. 1971 March 15 - . Launch Site: Baikonur. LV Family: UR-100. Launch Vehicle: UR-100K. Last State trials launch - . Nation: Russia. Agency: RVSN. Apogee: 1,000 km (600 mi). 1971 June 3 - . Launch Site: Baikonur. Launch Vehicle: UR-100. FAILURE: Failure. 1971 June 16 - . Launch Site: Baikonur. LV Family: UR-100. Launch Vehicle: UR-100U. 1971 June 16 - . Launch Site: Bershet. Launch Vehicle: UR-100. 1971 September 1 - . Launch Site: Baikonur. LV Family: UR-100. Launch Vehicle: UR-100M. 1972 - . Launch Site: Baikonur. LV Family: UR-100. Launch Vehicle: UR-100U. 1972 - . Launch Site: Baikonur. LV Family: UR-100. Launch Vehicle: UR-100K. 1972? - . Launch Site: Teikovo. Launch Vehicle: UR-100. 1973? - . Launch Site: Dombarovskiy. Launch Vehicle: UR-100. 1973 - . Launch Site: Drovyanaya. Launch Vehicle: UR-100. 1973? - . Launch Site: Teikovo. LV Family: UR-100. Launch Vehicle: UR-100K. 1973 - . Launch Site: Baikonur. LV Family: UR-100. Launch Vehicle: UR-100U. 1973 February 1 - . Launch Site: Baikonur. LV Family: UR-100. Launch Vehicle: UR-100K. 1973 February 1 - . Launch Site: Baikonur. Launch Vehicle: UR-100. 1973 May 29 - . Launch Site: Kostroma. Launch Vehicle: UR-100. 1973 Jul - . Launch Site: Dombarovskiy. Launch Vehicle: UR-100. 1973 October 13 - . Launch Site: Baikonur. LV Family: UR-100. Launch Vehicle: UR-100K. 1973 October 18 - . Launch Site: Baikonur. LV Family: UR-100. Launch Vehicle: UR-100K. 1974? - . Launch Site: Dombarovskiy. Launch Vehicle: UR-100. 1974 - . Launch Site: Baikonur. Launch Vehicle: UR-100. Combat training launch - . Nation: Russia. Agency: RVSN. Apogee: 1,000 km (600 mi). 1974 - . Launch Site: Baikonur. LV Family: UR-100. Launch Vehicle: UR-100K. 1974 Jul - . Launch Site: Dombarovskiy. Launch Vehicle: UR-100. 1974 September 5 - . Launch Site: Baikonur. Launch Vehicle: UR-100. FAILURE: Failure. Combat training launch - . Nation: Russia. Agency: RVSN. Apogee: 0 km (0 mi). 1975 - . Launch Site: Baikonur. LV Family: UR-100. Launch Vehicle: UR-100K. 1975? - . Launch Site: Dombarovskiy. LV Family: UR-100. Launch Vehicle: UR-100K. 1975 - . Launch Site: Drovyanaya. Launch Vehicle: UR-100. 1975 - . Launch Site: Baikonur. Launch Vehicle: UR-100. 1975 May 29 - . Launch Site: Kostroma. Launch Vehicle: UR-100. 1975 September 5 - . Launch Site: Baikonur. LV Family: UR-100. Launch Vehicle: UR-100K. FAILURE: Failure. 1975 September 29 - . Launch Site: Baikonur. LV Family: UR-100. Launch Vehicle: UR-100K. FAILURE: Failure. 1976 - . Launch Site: Baikonur. LV Family: UR-100. Launch Vehicle: UR-100K. 1976? - . Launch Site: Dombarovskiy. LV Family: UR-100. Launch Vehicle: UR-100K. 1976 - . Launch Site: Baikonur. LV Family: UR-100. Launch Vehicle: UR-100U. 1976 February 19 - . Launch Site: Kostroma. Launch Vehicle: UR-100. 1977? - . Launch Site: Dombarovskiy. LV Family: UR-100. Launch Vehicle: UR-100K. 1977 - . Launch Site: Teikovo. LV Family: UR-100. Launch Vehicle: UR-100K. 1977 - . Launch Site: Drovyanaya. Launch Vehicle: UR-100. 1977 - . Launch Site: Baikonur. LV Family: UR-100. Launch Vehicle: UR-100K. 1977 Sep - . Launch Site: Teikovo. LV Family: UR-100. Launch Vehicle: UR-100K. 1978? - . Launch Site: Dombarovskiy. LV Family: UR-100. Launch Vehicle: UR-100K. 1978 - . Launch Site: Drovyanaya. Launch Vehicle: UR-100. 1979 August 3 - . Launch Site: Kostroma. Launch Vehicle: UR-100. 1980 - . Launch Site: Teikovo. LV Family: UR-100. Launch Vehicle: UR-100K. 1981 - . Launch Site: Gladkaya. LV Family: UR-100. Launch Vehicle: UR-100K. 1981 September 11 - . Launch Site: Bershet. LV Family: UR-100. Launch Vehicle: UR-100K. 1982 - . Launch Site: Teikovo. LV Family: UR-100. Launch Vehicle: UR-100K. 1982 May 20 - . Launch Site: Kostroma. Launch Vehicle: UR-100. 1982 June 11 - . Launch Site: Bershet. LV Family: UR-100. Launch Vehicle: UR-100K. 1982 August 13 - . Launch Site: Gladkaya. LV Family: UR-100. Launch Vehicle: UR-100K. 1983 - . Launch Site: Teikovo. LV Family: UR-100. Launch Vehicle: UR-100K. 1983 March 3 - . Launch Site: Kostroma. Launch Vehicle: UR-100. 1984 - . Launch Site: Baikonur. LV Family: UR-100. Launch Vehicle: UR-100M. 1984 May 25 - . Launch Site: Bershet. LV Family: UR-100. Launch Vehicle: UR-100K. 1985 - . Launch Site: Teikovo. LV Family: UR-100. Launch Vehicle: UR-100K. 1986 April 11 - . Launch Site: Gladkaya. LV Family: UR-100. Launch Vehicle: UR-100K. 1986 June 6 - . Launch Site: Bershet. LV Family: UR-100. Launch Vehicle: UR-100K. 1987 - . Launch Site: Teikovo. LV Family: UR-100. Launch Vehicle: UR-100K. 1987 January 21 - . Launch Site: Bershet. LV Family: UR-100. Launch Vehicle: UR-100K. 1989 February 22 - . Launch Site: Bershet. LV Family: UR-100. Launch Vehicle: UR-100K. 1989 September 15 - . Launch Site: Bershet. LV Family: UR-100. Launch Vehicle: UR-100K. 1990 July 17 - . Launch Site: Bershet. LV Family: UR-100. Launch Vehicle: UR-100K.